A crown (or cap) is a covering that encases the entire tooth, restoring it to its original shape and size. A crown protects and strengthens tooth structure that cannot be restored with fillings or other types of restorations. 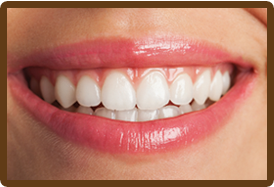 In many instances, with all-ceramic crowns, the crown can be completed in one appointment. 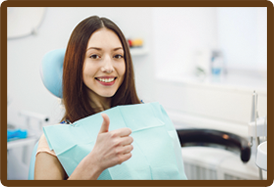 Sometimes a crown procedure may requires 1 to 2 appointments. Your first appointment will include taking highly accurate molds (or impressions) that will be used to create your custom crown. A mold will also be used to create a temporary crown which will stay on your tooth for approximately two weeks until your new crown is fabricated by a dental laboratory. 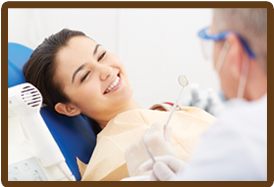 Dr. Trujillo will provide care instructions and encourage you to have regular dental visits to check your new crown. A denture is a removable dental appliance replacement for missing teeth and surrounding tissue. They are made to closely resemble your natural teeth and will enhance your smile. There are two types of dentures – complete and partial dentures. Complete dentures are used when all of the teeth are missing. Partial dentures are used when some natural teeth remain. A partial denture not only fills in the spaces created by missing teeth, it prevents other teeth from shifting. A complete denture may be either “conventional” or “immediate.” A conventional type is made after the teeth have been removed and the gum tissue has healed. Immediate dentures are made in advance of extractions of remaining teeth and immediately placed after the teeth are removed, thus preventing the patient from having to be without teeth during the healing process. Once the tissues shrink and heal, adjustments will have to be made to help the denture fit better. The process of getting dentures requires several appointments, usually over several weeks. Highly accurate impressions (molds) and measurements are taken and used to create your custom denture. Several “try-in” appointments may be necessary to ensure proper shape, color, and fit. At the final appointment, Dr. Trujillo will precisely adjust and place the completed denture, ensuring a natural and comfortable fit. Dr. Trujillo will provide care instructions for your new dentures. Proper cleaning of your new dental appliance, good oral hygiene, and regular dental visits will aid in the longevity of your new dentures.